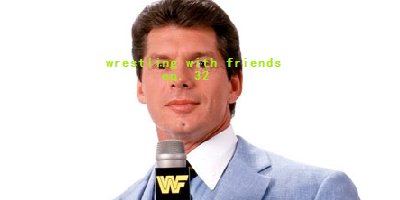 You've come to the right place to get your weekly wrestling fix, and this week, it's not simply Wrestling With Friends...as in the second hour we're switching to FRIENDS ARE WAR! That's right—though things seem relatively cordial at first, with some chit-chat about the latest happenings (aka recent firings) at WWE, what TNA is still even trying to do and fun with the Indies, things naturally turn bloody and violent as the Friends make the corner to the second segment this week. Because, once again, it's time for the Judy Bagwell Awards! And for this installment, the friends aren't taking any prisoners in their Canadian Hotboxes. It's a bloody battle of bogus Bagwell picks as the long-dead memories of Dr. Heiny operating on Jim Ross, Robocop in WCW and Santino's love "sickness" are all brought to the fore. Guest judge Jered makes his second appearance, and you better believe he doesn't take this honor lightly! Will there be a return to The List and the Friends' #74 picks? We may never know! Final Song - DJ Mayhem & MC Mouthmaster Murf, "Robocop Rap"